My Kingdom for a Pair of Glasses! In our last episode of Tom’s Broken Glasses (yes, they are taking on a life all their own), I spared myself the expense of new four to five-hundred dollar glasses by doing a little home repair–plastic glue to the rescue! 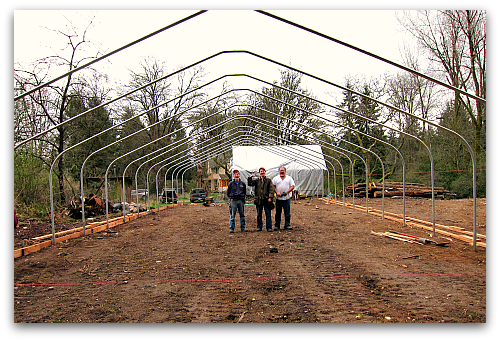 My hardworking pals Rick and Tamara, and I ignored the forecast and the clouds, and settled into the methodical and labor-intensive task of building a steel framed hoop house. Think ginormous steel whale skeleton. The rain came with a vengeance, producing a chilly pelting that soaked us to the bones. I seemed to think a cotton sweatshirt could repel nature’s torrent. Bent over, water dripping drip off the brim of my cap, glasses steaming up and rendered useless, I began to fantasize about a trust fund and condo in the city. At that moment, as I pushed my glasses back up my nose, the right lens popped out. 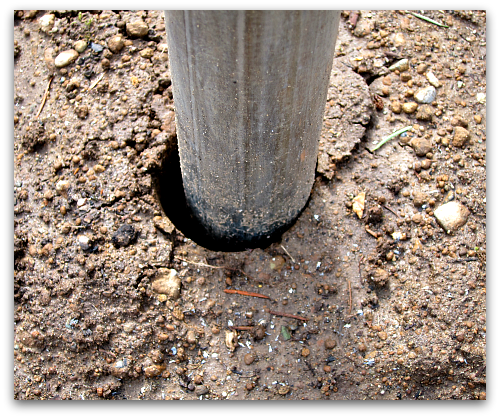 In a lifetime movie moment and definitely in slow motion, I watched it spin and spin and spin and pop right into the rabbit hole that was between the foundation bow pole and the compacted earth. If this had been a carnival ring toss, I would have won a car. While I was not proud of the stream of words that followed, I did apologize to all ears present. Before the big dig and rain: celebrating the installation of the steel bows. Rick suggested we use a post hole digger to make a new parallel hole next to the pole, remove the hoop and go in from the side, much like the successful freeing of the Chilean miners. Tamara, a woman who never met an improvised tool she didn’t like, suggested we remove the hoop, and she could get salad tongs or thin slat of wood to bring up the lens. For me, all plans were on the table. (Did I mention that I have no back up glasses?) Tamara returned with a wooden crepe spatula (a really nice French oak crepe spatula) and stainless steel salad tongs. While Rick dug a post hole, I held up one steel pole so we could see down the hole with a flashlight. Extricating the pole and keeping it vertical was quite a challenge in itself. Bad mix: the hole, the pole, and a loose lens. We could see the lens about 18 inches down, but when we removed the pole, it fell to the bottom of the hole along with copious amounts of clay, hard-pan and gravel. Tamara got an “A” for effort and persistence, but the kitchen utensil plan came up short due to the new depth and a hole too small for any adult hand. Rick bored down to about 30 inches and then he broke through to the hole on the other side, but alas, no lens. More digging, more grunting, more rain-soaked sweatshirt, more gratitude for friends who would even have stayed around during this personal excavation. At last we found it, the lens that acted more like a razor clam, slipping deeper down the more we tried to dig it out. A little Dawn detergent and warm water later, the lens was placed back in the cracked frame and secured with painters tape–a look becoming my current sartorial status. Unfortunately, the lens was pretty scratched. Back to work we went, remarking that the rain was as relentless as our determination to find my lens. What next for Tom’s Broken Glasses? Who knows, but for now blue painter’s tape is part of my eye-wear standard, one that will keep me seeing clearly enough to finish my hoophouse. Stay tuned for (hopefully) the final installment of my eyewear mini-series. spinning down the rabbit hole? sounds like a lost chapter by lewis carroll! Tom…that is too hilarious! So glad you managed to get your lens back…and yes you may well be starting a new fashion trend! One word for you Tommy boy… contacts. 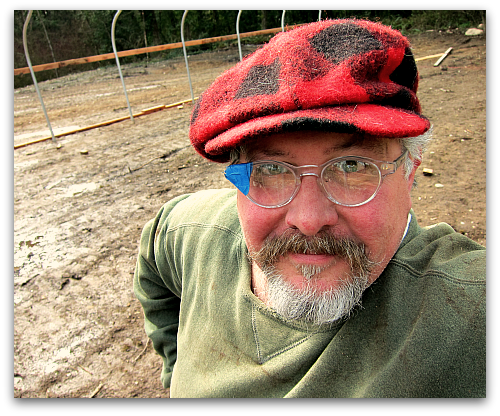 And yes I can testify that the multi lens versions do work on our increasingly aged eyes. Nice hoop house, love the roof shape. Hilarious escapades. Thank goodness for good friends. While you are waiting for inspiration (or possibly lottery winnings) to guide your acquisition of replacement glasses, play up the tape accent. Find different colors of tape and ‘accessorize’ by changing it regularly. Islanders can pull this off. 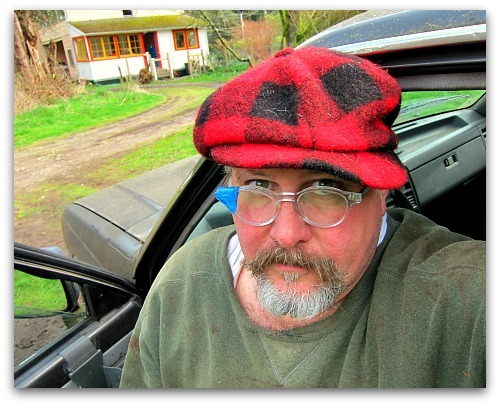 Firstly – I had no idea progressive lenses costed that much! I agree with one commenter; assorting the tape to your outfit would be the stylish and frugal way to go. Have you tried JC Penny Optical? I’ve gotten 2 pairs of glasses through them and they were about $350, not bad for progressive lenses and they have a reasonable selection of styles. And very awesome hoop house!! Okay please do a post on the hoop house. How big is it? What are you going to grow?? Tom- I too looked on the Zenni site – #430023 in clear and #246425 tortoise shell . Both under $30 , I totally see you in tortoise shell. Totally. Thanks Kim, what’s so funny is I have the 430023, I ordered them as reading glass frames. Good taste Kim! I’ll check out zenni again!